If your kids are into superhero movies, then you MUST see Spider-Man: Into the Spider-Verse. It doesn't matter if you are into comic books, know all the backstories, or are just a casual fan (like my family is), you will enjoy this movie. It is only rated PG and, although intense at times, is great for a wide age range of kids and adults! The movie follows the story of the Spider-Man you know and love, along with Miles Morales, as well as other Spider-Man characters from alternate universes. Even if you have never heard of the other "Spider-People" before, you will grow to love them. I won't give away any more of the plot, but I will give you the secrets to making my Spider-Man Miles Morales lunch! Make sure to check out the trailer for the movie below and you can see why I made this lunch the way that I did. 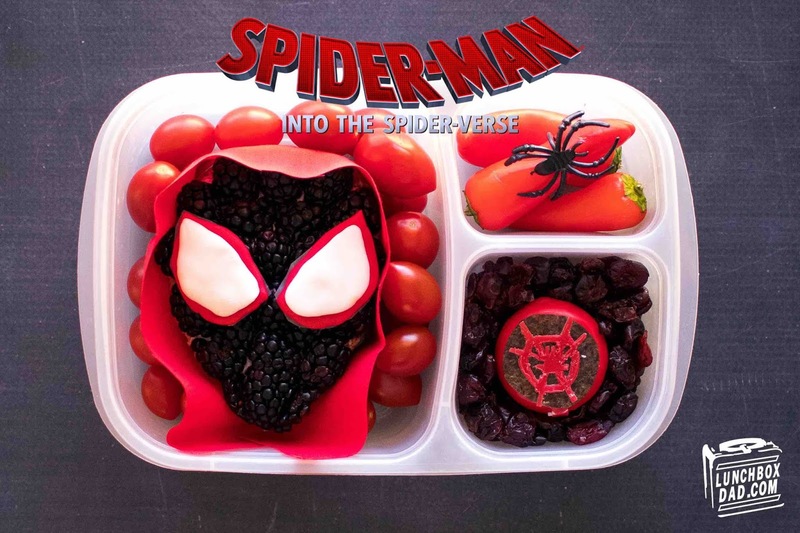 Also don't forget to check out my other Into the Spider-Verse lunch recipes this week right here on my blog! 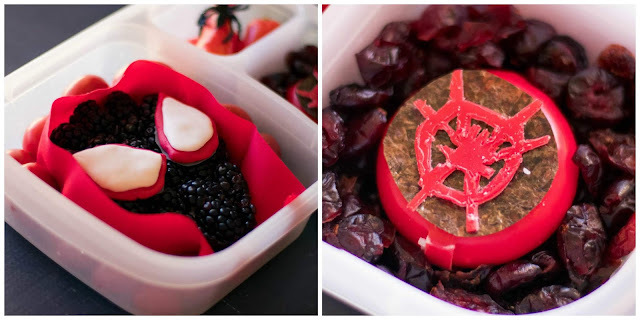 Ingredients: Blackberries, almond butter, whole wheat bread slices, red napkin, grape tomatoes, red and white fondant, dried cranberries, cheese round covered in red wax, nori, red sweet peppers, black spider decoration. 1. Spider-Man Miles Morales' head is basically an open-face sandwich. However, instead of jam I used blackberries. Spread on the almond butter to keep the berries in place. Place in main compartment on a red napkin which forms the red hoodie. Surround with grape tomatoes, raspberries, or any other red fruit or veggie. Top with a very small amount of red and white fondant for the eyes. 2. Cut wax off the back of the cheese round and create Miles' Spider-Man logo with it. Place on top of nori and on top of the cheese. Put in side compartment on top of dried cranberries or raisins. 3. In second side compartment place red vegetables like sweet peppers and top with a spider decoration. Pin This Spider-Man Miles Morales Lunch Recipe!